Miley Cyrus prepared for April 3, an average workday, by reading the Bible  a few chapters of Job  and ended it by telling a ribald joke as she walked off camera at Access Hollywood. In between she had a casting session for her next movie, The Last Song, written specially for her by weepie king Nicholas Sparks; was interviewed four times; performed twice; changed outfits twice; and visited the Tonight Show’s make-your-own-sundae bar once. When she left the NBC lot at 6:30 p.m., she still had to do her homework. Like Job’s, Cyrus’ life story has been made into a book, Miles to Go. Hers is a memoir and a little longer , but both are tales of remarkable turns of fortune. At 12, Cyrus scored the lead role in the Disney TV series Hannah Montana, about a teenager, also named Miley, who is secretly a ginormous teen pop star. Four years later, Cyrus is very publicly a ginormous teen star, with three best-selling albums , the memoir , a sold-out concert tour, a record-obliterating 3-D concert movie, enough merchandise to test the deepest parental pockets and, on April 10, Hannah Montana: The Movie. 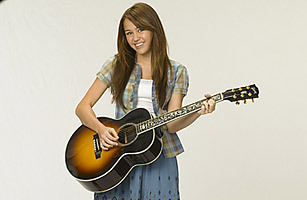 In the film, Miley Stewart is banished to her grandmother’s home in the country after pulling some tabloidy teen-star antics. It’s the kind of place where evenings are spent on the porch with nothing for entertainment but a guitar and Rascal Flatts. Where a girl can declare her love for a guy by renovating a chicken coop. Where father and daughter can sing a duet the father has never heard of in a pergola on a misty hill. But wouldn’t you know it  the idyllic hamlet needs the help of someone: Hannah Montana. TMZ meets Tennessee is the central theme not just of the Hannah narrative but also of the Miley Cyrus one. It’s a story as old as The Beverly Hillbillies, but instead of the blue-state-red-state cultural differences being played off each other, they are set in counterbalance. In Miley-the-creation and Miley-the-girl, we have someone who’s cool but wholesome, sophisticated but innocent, glamorous but sweet. Her appeal crosses cultural lines and, accordingly, elicits different reactions. On Access Hollywood, a bespectacled boy gives her flowers, while a 20-something asks where she wants her first tattoo. Just as deftly, the Montana myth has updated the princess fantasy. No longer are you secretly royalty; now you’re secretly famous. You can be accomplished and admired without sacrificing your innocence or family life. The show trades on this illusion by acknowledging that the Hannah persona is an artifice, all makeup and wigs. Holding this mirage together requires an authenticity on the part of Cyrus and a careful balancing act on the part of her team. Cyrus keeps up her end pretty well. She’s a regular, gum-snapping teen  not too polite, mature or articulate. She talks evenly in her husky voice about how, like Job, she’s set up for trying to be good, then does a spot-on impression of a contestant on America’s Next Top Model.But sometimes the whole thing comes unglued, as it did last year when she posed for Vanity Fair clutching a satin stole to her bare chest. Then it seems as if the fault lines in the culture run right through her. Reactions to the photo ranged from outrage on her behalf to outrage against her, along with told-you-sos and no-big-deals. A 16-year-old can hardly be expected to grasp the nuances of such tempests, so it’s understandable that Cyrus sounds coached on the subject: “I’m here to be a role model and set an example, but I’m not here to be a parent and to not make mistakes,” she says. “As kids are growing up, so am I.” Therein lies the rub. Between the safe harbor of girl icon and the beckoning shores of ingenue-dom are treacherous shoals. And just at the age when young people have some license to make mistakes, hers are monitored and widely broadcast. “There’s no way to circumvent the Internet,” says her manager, Jason Morey. “And there’s no way to stop a girl from growing up without creating something that’s not real. Could we handcuff Miley and stick her in a box and tell her, ‘Don’t grow up’ We could try, but there’s nothing more uninteresting in the world.” Cyrus’ ace in the hole is that, unlike Lindsay Lohan or Britney Spears, she seems to come from a big, stable family with some experience in the fickleness of fame. Her father Billy Ray Cyrus, of “Achy Breaky Heart” and mullet fame, plays her dad on the show. Her mother Tish works closely with Morey on Miley’s career. Miley has four siblings, and her grandmother, a Southern belle with cotton-candy hair and Cleopatra eyeliner, accompanies her to most appointments. Still, Cyrus is beginning to question her stardom. She “had a moment,” she says, while auditioning kids for her movie, when she got a glimpse of how long the odds were for most of them and how fluky her life was. Perhaps, after all, outsize fame is more suited to young teens. They don’t overthink it. The Book of Job is 41½ chapters about misery and 10 verses about restoration, yet Cyrus read it as being about her. That’s a mind trick only a teenager  or a star  can pull off. See pictures of the youngest Best Actress nominees. See pictures of movie costumes.